Underbar spraytanvätska från Amerikanska Lavishtan. Håller på kroppen i 7-12 dagar. Patenterad formula på brunt socker, naturligt söt doft (ej kemisk). EXPRESS solution gives your clients the option to shower in as little as 2-hours! Lavish Tan EXPRESS solution processes faster on the skin, allowing you to shower within only a few hours after application. Allow 2-hours for light shade, 3-hours for for medium-light shade, and 4-hours for a medium shade. Voted best organic airbrush tanning solution in U.S.A.- 2012 by Allure Magazine. 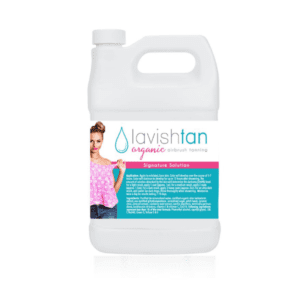 Lavish Tan’s unique blend of organic ingredients is designed for all skin tones Light-Medium-Medium Dark. One Solution For All Skin Tones!